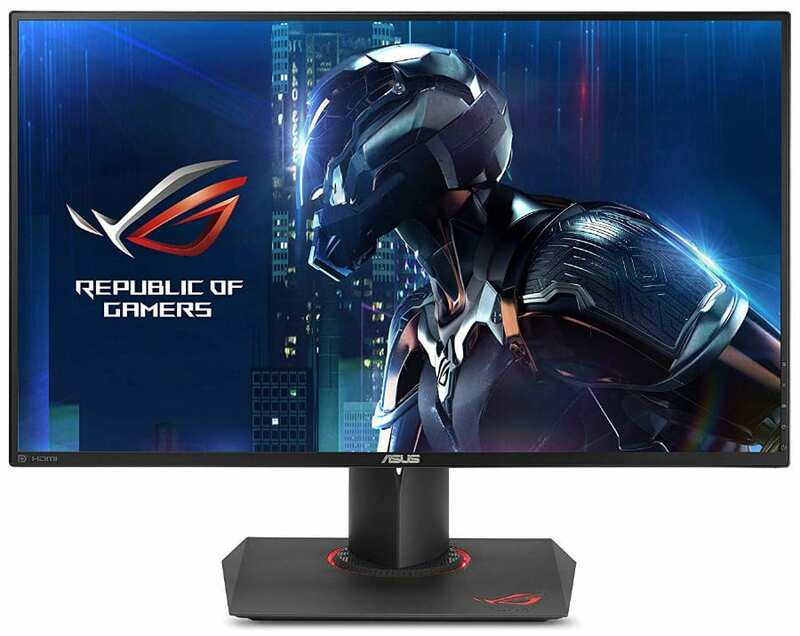 The Asus PG279QZ is the refreshed and presumably improved version of the successful PG279Q which has combined a vibrant screen with great performance. This new variant sports a few improvements over its predecessor along with a very reasonable price that would tempt a lot of gamers. The Asus PG279QZ’s formula has been around for some time, but how does this new model fit in a portfolio of curved and RGB-fied offerings the brand is pushing? The Asus PG279QZ sports a familiar and widely preferred aesthetic that we love over the crazier second-generation treatment on some latest models. The device has a nice, matte black chassis that’s nice to the touch and is easy to maintain since the surface doesn’t retain smudges. The face isn’t truly bezel-free, but the panel borders brought about by the dual stage design falls within reasonable limits. Almost every aspect of the old PG line’s design was retained, including the control layout. You get a few hotkeys for some of the monitor’s features along with a uni-directional joystick which makes OSD manipulation easier. There is a dedicated button for the Asus PG279QZ’s GamePlus, and GameVisual presets which adds gaming value to the display. The only characteristic that changed between the Asus PG279QZ and the older PG279Q is the slight difference in measurements. The outstanding build quality and craftsmanship are still there despite being a refresh, ensuring that the owner can enjoy the display for quite some time. The 15.4 lb is lighter than some options, but it doesn’t in any way cheapen the device’s feel. One of our favorite features on the Asus PG279QZ is its excellent ergonomic stand that is as durable as any can get. The mechanism allows users to adjust height, tilt, swivel, and pivot the screen, so getting a perfect view angle is easy as peas. It’s also easily removable, in case you want to opt for a VESA mount. The squarish base of the device provides excellent stability, although it does eat up a lot of precious desktop space. This part also has red LEDs on the upright’s neck and the ROG eye logo at the corner which can be turned on or off via the OSD. Frankly, we would have liked to see color changing options so the device can catch up with the current trend of the market. The Asus PG279QZ has a limited I/O layout that’s enforced by its build-in G-Sync controller. Users only get DisplayPort 1.2 and a secondary HDMI 1.4 slot for inputs, along with two USB 3.0 slots for peripherals. FreeSync monitors with better layouts are now viable options since some are G-Sync compatible, but we’re afraid some might run into a few hidden drawbacks in the near future. The Asus PG279QZ sports a 27-inch IPS panel with a 2560 x 1440 resolution, a 165Hz refresh rate, and 4ms response time. The screen is powered by a 350 cd/m2 backlight and is rated to produce a 1000:1 contrast ratio. 1440p at 27 inches is the current sweet spot between the aging 1080p resolution and 4K UHD since it isn’t as GPU hungry as the latter while still providing excellent sharpness. High refresh QHD monitors are fast becoming the standard for gamer households since prices have come down drastically and GPUs are now more powerful than ever. The Asus PG279QZ still uses this combination which makes it a more practical choice over the new 4K 144Hz monitors available. It’s also worth noting that QHD monitors of this size do not require scaling in most cases despite the sharpness of the screen. The Asus PG279QZ scores very decent results in colorimeter tests, but there is some room for improvement. The display can produce 99% sRGB coverage with a DeltaE accuracy of 3.4 which is a bit high when compared to the older model. Calibration can correct the errors down to 2.17, which tones down the screen’s extra blush or warmth. The screen offers excellent vibrancy and errors will be most visible when sat next to a better display. The Asus PG279QZ’s gamma is also slightly off at 2.1, contributing to the warmth of the screen. A few tweaks can correct this to a much more ideal 2.19, although you can lock the screen to the available gamma presets in the OSD. It’s disappointing that the older PG279Q and the revamped PG278QR has better scores, but gamers will be pressed to see the differences. One excellent characteristic of the Asus PG279QZ is its fantastic contrast which can reach as much as 1190:1. The new IPS panel used shines in this aspect, although it still is plagued with a slightly lower black depth. The screen looks a bit grayish when viewing pure black images, but its less apparent when playing games or movies. This flaw is somehow affected by the weaker backlight on the Asus PG279QZ, which failed to reach the 350 cd/m2 spec in the list. The monitor can only achieve 325cd/m2 which isn’t bad, but the older version can go all the way up to 390 cd/m2. Don’t get us wrong, 300 cd/m2 or more is plenty and at times excessive for most cases, but monitors with ULMB need the extra brightness. One of the supposed improvements of the Asus PG279QZ is it should be less prone to backlight bleeding. The test unit did not showcase any deal-breaking flaws, but there is some clouding at the corners. Games and images are mostly unaffected, plus the IPS lottery concept applies so this will vary between unit to unit. But on a positive note, the Asus PG279QZ doesn’t require its ULMB feature since it can handle motion superbly. You only need to activate the normal level for the OD setting in the OSD to get a blur and image-retention free output from this model. We tried the OD Extreme option, but it induced overshoot which isn’t ideal for any game genre. The Asus PG279QZ comes equipped with a G-Sync module, so it should be directly compatible with the latest Nvidia GPUs. This feature combined with the 165Hz overclock feature (which is instant and guaranteed) makes the device sufficient for years to come. 4K 144Hz is already available, but there is little need to spend almost two grand when you can enjoy crisp and smooth visuals with a reasonably-priced option like this model. Finally, the Asus PG279QZ keeps up with the ROG Swift line’s tradition of ultra-low input lag for on the dot speed and accuracy. The monitor’s input lag stays at 4.3ms using its 165Hz refresh rate, so there are virtually no delays caused by latency. This model is as good as our beloved Asus PG278QR and is ideal for competitive gaming. The Asus PG279QZ is an attractive option despite a few misses when compared to its esteemed predecessors. The imaging qualities are not as tight as we’ve previously seen, but the monitor is fantastic for mixed-use and gaming. The G-Sync functionality combined with very low latency is a highly sought after capability that most competitors have struggled to reach. 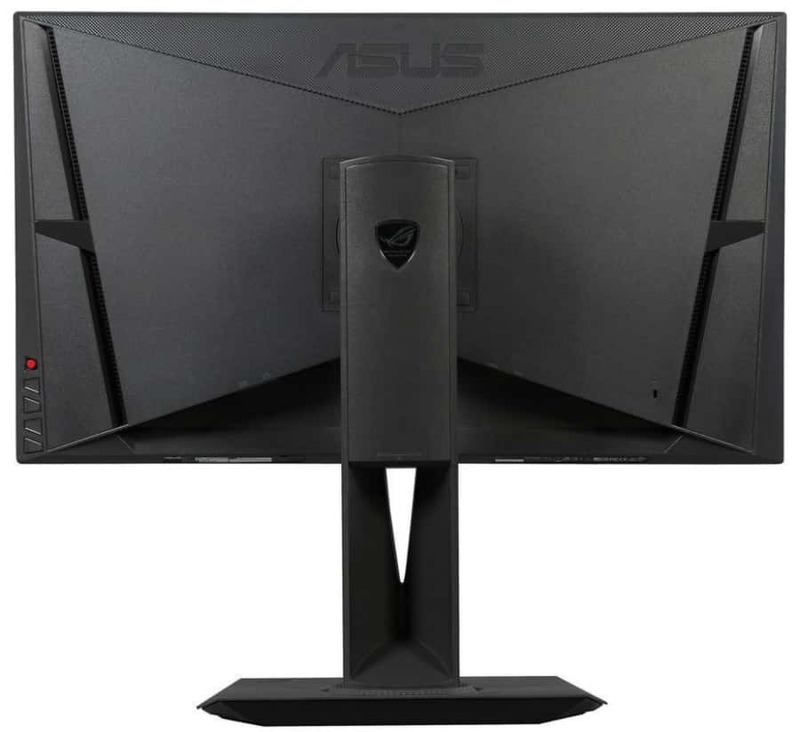 It’s great that the Asus PG279QZ is priced close to the Asus PG278QR, narrowing the gap between IPS and TN-based gaming monitors. It’s also a tough-sell when you can opt for the older model if you can find it new since it sells at the same price point and some advantages in imaging quality. If you are looking for a G-Sync IPS gaming monitor with high refresh rates and low latency, the Asus PG279QZ should at least make the top three of your list.